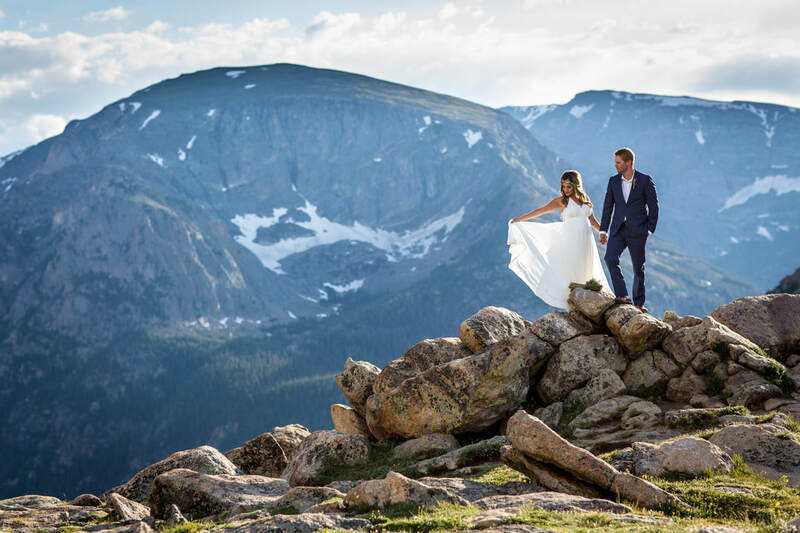 Brittany and Ben were married on a bridge, on the beautiful grounds of Della Tera in Estes Park. It was just them, me, and their photographer. What a privilege to be near them, witnessing their vows, and simply catching just a little of the feelings that they expressed to one another. We acknowledged that, in the moment, they had family and friends back home who surely were with them at a heart level, and looking forward to being with them for a great celebration when they return, as husband and wife! A little voice said, 'You're going to marry this guy." ​A great joy I have in performing weddings is getting to speak about the couple's love story. How they found each other, their first impressions of one another, highlights of their romance. Very sweet, humorous, and fun tales. The wedding guests love it. Last weekend, I got to talk about Katherine and Eric's courtship, sharing with everyone that, when Katherine first laid eyes on Eric, a voice inside her head clearly said, "He's the one! You're going to marry this guy!" But at the very moment Katherine was being struck by Cupid's arrow, another woman swooped in and shamelessly began flirting with Eric. The result of which delayed their romance a bit. Eric dated the other woman for a few weeks before coming to his senses. He ended the relationship and succumbed to the power of Katherine's inner voice. Today, they're on their honeymoon! The "other woman" was not invited to the wedding. I recently received a check in the mail from the father of a bride with a note that read, "Please find enclosed a check for the balance of the fee for marrying my little girl." A tender sentiment, one that I often see brought to light on the faces of moms and dads at weddings. My goodness, what a range of emotions we all get to experience on these most remarkable of days! I do this work because I am deeply touched by the love revealed in wedding ceremonies. I’m blessed to be nearby when a bride and groom open their hearts and profess their most sincere affection to each other. I hope that my participation helps to bring about a sense of reverence to the moment, so much so that everyone present honors the covenant being played out before their eyes. People choose to get married in a ceremonial way because they understand – we all understand – that the moment deserves to be extraordinary. The act of two people making such intimate promises to one another with such transparency deserves the respect and awe of everyone witnessing it. I try to help create the space for that to happen. I like supporting couples in knowing that there is meaning to their lives and that their sacred union serves a high purpose. Weddings are magical moments when the goodness of two lives shared is brought into the light and celebrated. We who bear witness to these hallowed gestures are blessed. 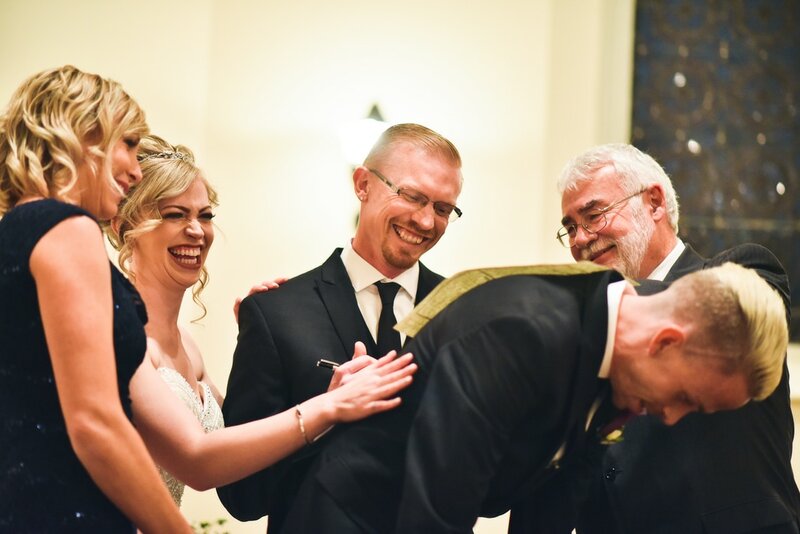 A great moment that some couples experience on their wedding day is the signing of the marriage license on the back of their best man, with the maid of honor also getting in on it as a witness. I tell the best man that the groom and bride are literally getting married on his back. It never fails to make the newlyweds and their best people laugh and smile. The results are a legal marriage, great memories, and animated, fun pictures! Imagine looking at this shot decades from now! A recent wedding I performed in the foothills of the Rocky Mountains turned out to have a rather enchanting look and feel. It was a rainy, misty day and, yet, the couple chose to go ahead with their outdoor ceremony. We stood on a bluff overlooking a beautiful, green meadow and, with the mist and the fog, one could easily have imagined we were in the natural wonder of Scottish meadows. A fitting ambience, given that we had a touching hand-fasting moment in the ceremony, a Scottish tradition that gives rise to the binding of the bride's and groom's hands, hearts, and lives. The fasting, the beauty of the green valley through the mist, and the very atmosphere of love brought them home, and sanctified their union. Here's a tip on how to make your wedding day truly memorable: let go. When your wedding day arrives, have everything in place so well that you can quit managing, detailing, and arranging things. This can be accomplished by, first, keeping things as simple as possible. Second, let your friends help you by being responsible for tasks and details. And, third, if you can swing it, hire a day-of coordinator to manage the event. (See my favorites to check out a couple of coordinators.) I have witnessed brides who are frantic on their day, thus missing the true experience. And I've seen brides who are relaxed, just hanging with their friends, enjoying each moment. The bride who is fully present - seeing joy in others' eyes, noticing the fragrances and sounds of the moment, seeing the sunlight or rain filtering through the trees -- will feel the beauty of the experience long after the vows are spoken and the last dance is finished. The magic of your wedding day isn't in the details; it's in the mindfulness of each moment, and the gratitude in your heart. That, and the touch of one who loves you, as well as those chocolate truffles! In a wedding ceremony last weekend, I took a moment to honor the groom for his service to our country. He had recently returned from Afghanistan, and I shared that both he and his bride live their lives so selflessly. They both always look after others, put others first. When, on behalf of everyone present, I thanked him for his service to our country, for helping to keep us all safe, I noticed that his parents' eyes glistened, his bride looked at the man she was marrying with pure admiration and pride, and his friends and family smiled with a look of affection and gratitude. True love, showing itself in their wedding, in lots of beautiful ways. I am so blessed to work as a wedding officiant in Colorado. What a privilege to be with couples in such a chief moment, to witness their promises, and to be in the presence of true love. Wow!